Thirsty Pilgrim: Old Beer. I Mean, Really Old. Old Beer. I Mean, Really Old. 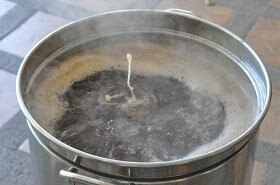 The cold, hard, known part: Brewing is at least 6,000 years old. We "know" this as well as we can know anything that happened 6,000 years ago thanks to some Mesopotamian tablets that record beer trade. Two obvious things worth mentioning about that cold, hard, known part: (1) We only know it because somebody was keeping records, and (2) those tablets were built to last. Bear in mind that not every ancient society excelled at record-keeping, and those that kept records did not always use materials that last six millenia and counting. We can take "known" as far back as 9,000 years if we accept residue on old broken Chinese pots to be as authoritative as cuneiform tablets. And why shouldn't we? Now, some scientists hate to speculate. Thank goodness there are some who can't seem to get enough of it. On top of that, beer is relatively easy to brew and can be made from just about anything—all you need is water, cooking heat and some form of carbohydrate, along with enzymes and yeast that are abundant in nature. (The yeast can come from fruit; the enzymes from saliva.) "It's pretty darn easy to make," Hastorf said. She cited colleagues who have advanced theories that humans first domesticated cereal crops to make beer, not just bread, and that humans evolved to associate ethanol, which is present in ripe fruit, with satiety. The various lines of evidence indicate that beer may well be as old as cooking itself, which began at least 250,000 years ago. "When people started harnessing fire and cooking, they probably started making beer," Hastorf said. *If you're into this sort of thing, check out my recent Chicha Posts. The short version: Brewing is probably much older and more common than we think, and it's a myth that Native Americans neither made nor drank fermented beverages. Another Reason to Stay in Brussels. Sam Calagione Has a Dream. The World Can Always Use More Pub Guides. Geuze, Geuze, and Non-Smoking News. What Can Beer Do For You? Edgy Beers in Germany's Capital. Midnight in the Cervecería of Good and Evil. Buy Books and Support Our Women. Drie Fonteinen to Brew Again? And Other News.